Spellcraft is all about building on what you already know, and that skill totally carries over to cooking! I’ve seen several different recipes for lasagna soup in my travels. It always seemed like a brilliant idea, but each recipe was missing something. I knew I needed to try it! In addition to craving more of those thick, wonderful noodles (they really are pretty magical), I wanted a soup that was as filling and comforting as lasagna- preferably without having to cast any complicated spells of fullness or having to add my magic beans- I’ve been saving those! 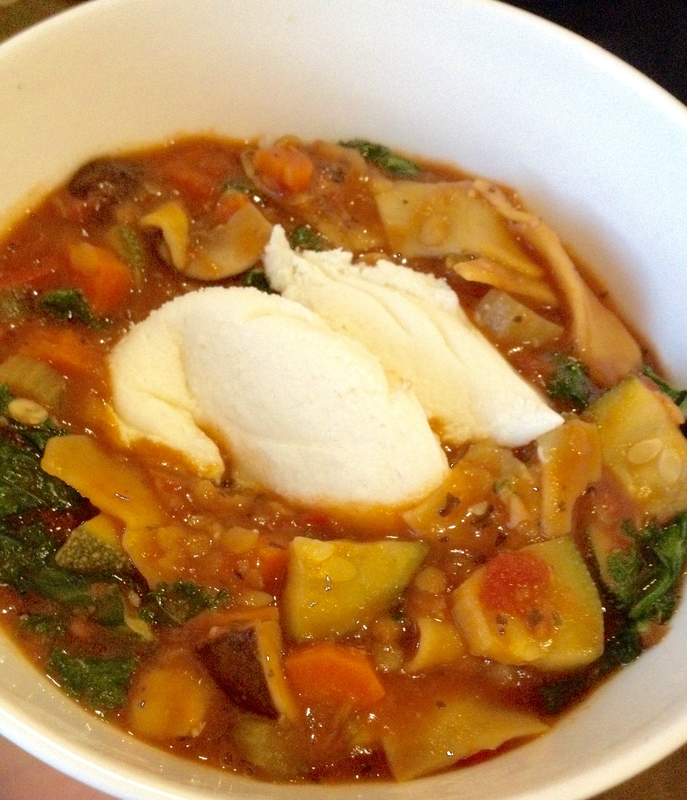 The answer hit me while stirring a cauldron of Red Lentil and Veg Marinara sauce (recipe here). I found myself staring at the bubbles and thinking how good a soup would be with that sauce as the base. It would be hearty and have a lot of nutritional value, and could even be made in the same cauldron! Plus, while lasagna tends to be an excuse to use a lot of cheese or cheese replacement, the soup presentation highlights the cheese and lets me savor it, but keeps the serving size manageable! Ricotta is my favorite cheese for lasagna (and I am still looking for a good plant magic spell to replace it- so if you have one, let me know!! ), so a dollop of that in the soup really did the trick for me! If you’re making these together, just start step one of the soup while the sauce is simmering on the last step after the lentils are cooked. If you are going to use the immersion blender (magic wand) on the sauce, do so first before adding the soup ingredients! Stir 6 cups broth, zucchini, mushrooms, chickpeas and noodles into the pot of marinara sauce over medium high heat. Once boiling, add additional oregano and salt, reduce heat to medium-low and cover. Simmer stirring occasionally for 25 minutes or until noodles are tender, then add kale and stir. Allow 1-2 minutes for kale to wilt, then serve with ricotta or other cheese if desired! This entry was posted in comfort food, Magic Upgrade, Powerful and Potent and tagged 1-pot, comfort food, dinner, great leftovers, healthy-ish. Bookmark the permalink.